Sandra of Snuffs Kitchen is the host for Bread Baking Day #50. She asked us to bake bread with vegetables. This got me thinking about Thai vegetables. There are so many Worldly vegetables, but I liked the idea of using Thai vegetables. But not all vegetables would do nice in bread. In Thailand there are a lot of different eggplants and even more different kinds of cabbages; all delicious with rice. But there is also delicious Phak bung (ผักบุ้ง) also known as morning glory. When fried it tastes like spinach. I wanted to add the special Chiang Mai sausage. Whenever you are in Chiang Mai you have to visit a local market like Warrorot market or Thanin market in the morning. Ask for Sai ua also known as Chiang Mai sausage. When you see a group of people waiting for their turn, there’s a big chance you found it. It’s already cooked so you can eat it on the spot by itself or with some sticky rice. Unless you are vegetarian or can’t eat a bit spicy, you’ll probably love it! Sai ua (ไส้อั่ว) is a type of sausage from Chiang Mai which is highly regarded in the rest of Thailand. It is a slightly spicy grilled pork sausage containing red curry spices and fresh herbs. The taste of finely shredded kefir lime leaves, coriander leaves and lemon grass permeates the dish. Last month the Bread Baking Babes baked Granville Island Beer Bread. I wasn’t able to join them, but the bread looked delicious and I was inspired by it. We had no beer, dried onion flakes and cheese, but we had Chiang Mai sausages and Phak Bung. Last night we ate half of the loaf. 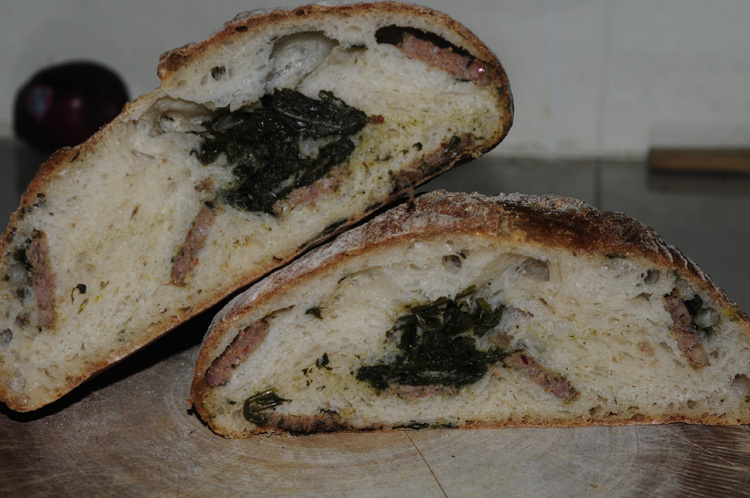 The crumb is soft and the spicy sausage with the spinach makes this a nice evening meal: delicious! This evening we will eat the other half, but now I’ll put some homemade yoghurt cheese with tomato and cucumber on top. I think we'll visit Chiang Mai soon for another sausage. Mix all the ingredients in a large bowl for the pre-ferment the night before, cover with plastic wrap and set aside till next day. Fry in a little bit of olive oil the phak Bung til it’s done. Let it cool down. In a mixing bowl put olive oil, 70 g of bread flour, instant yeast, salt, pepper and sugar, and mix all these ingredients together till well blended. Mix in another 105 g of flour. Start to knead the dough with the dough hook and continue to add a little flour till the dough becomes smooth (a little on the tacky side). This way you probably added between 280 – 320 gram of flour. Knead the dough for about 8 minutes. Place into a lightly oiled bowl, turn the dough over so all the sides are lightly coated. Cover with plastic and let rise for 1 hour or till it has doubled in size. Sprinkle a little flour onto a flat surface and flatten out the dough. Divide the sausage pieces and the phak Bung over the dough, roll it up and careful knead it in. Cover dough with plastic wrap and allow resting for another 15 minutes. Shape into a loaf and place onto a cornmeal parchment lined cookie sheet. Cover with plastic wrap and proof for 1 hour. In the mean time pre heat the oven with a bread pan with stones for steaming. Score the dough about an inch deep. Bake in a preheated 230º C oven for 11 minutes with steam and 30 minutes without steam until the loaf has a nice brown color. Or untill a thermometer places into middle of loaf reads 93º C.
Remove from oven and allow cooling on a wire rack. And that's why I love bread! Such variety. This would be a picnic. The sausage sounds divine and the Phak bung , oh how I would love to try that. and it tasted so great. This Chiang Mai sausage is the best we ever tasted. Full of Thai herbs and spices. I think a German variation will be great too.